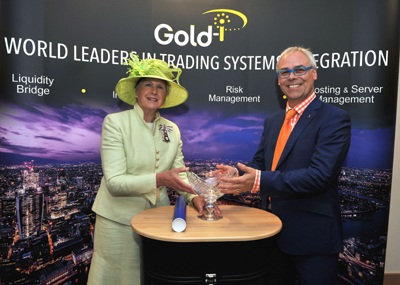 In an eventful week last week, Tom Higgins, CEO of Gold-i was presented to The Queen at Buckingham Palace in recognition of his achievements in winning the UK’s highest accolade for business success – a Queen’s Award for Enterprise. 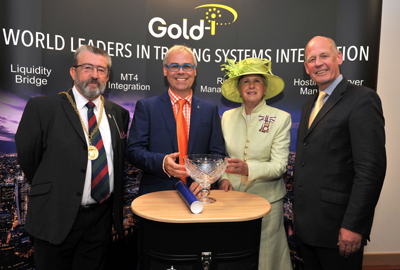 Two days later, the Queen’s representative, HM Lord-Lieutenant of Surrey, Dame Sarah Goad DCVO, presented the award to Tom Higgins at an official ceremony, also attended by the Mayor of Guildford, Councillor David Elms, at Gold-i’s office at the Surrey Technology Centre in Guildford. Tom Higgins commented, “Visiting Buckingham Palace and meeting the Queen was a remarkable experience. 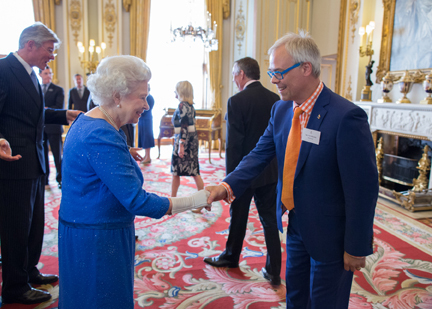 I was even given the opportunity to talk to her Majesty about Gold-i and our achievements to date. This event was followed a few days later by our own staff celebration, where the award was formally presented by Dame Sarah Goad and the Deputy Lord Lieutenant – another very special occasion. The Queen’s Award for Enterprise was given to the specialist financial trading technology company for Innovation in recognition of its achievements in disrupting a global market place by creating products which were not available from any other technology provider in the world. Over the last five years, Gold-i has transformed the global retail FX and CFD trading market by developing a suite of products which give retail brokers the same execution and risk management tools as institutional brokers, at a fraction of the cost. Gold-i products have improved the capabilities of retail brokers already in the FX market and have also enabled many regulated companies to enter the FX and CFD market for the first time.